List of Thunderkick casinos with honest review including reputability check of every Thunderkick online casino listed. A Stockholm based casino software provider that focuses on the online gaming market, Thunderkick was founded in 2012. The founders of Thunderkick casino software came with loads of experience, because they all were working at NetEnt before they decided to break away and form their own online casino software company. Their offices are located in Stockholm, and they hold a Maltese gaming license. Thunderkick is definitely an up-and-coming company to keep an eye on. With so much accomplished in such a short space of time, we can only begin to imagine how impressive they’re going to be in the years to come. Thunderkick is very different from its standard counterparts, just because of its unique approach to functionality and aesthetics. They always seek to combine new technology and tools to come up with ideas and products where these new concepts are being implemented in a more intuitive way to the end customer. Thunderkick games are based on a real-time 3D engine, using the engine from Unity, and share many common visual elements that you’ll hardly or never see on other machines. For example, more often than not the video slots have a moving and interactive background that changes as the game progresses. In addition to that, Thunderkick loves innovations on the animation front, and humour when it comes to symbols. Instead of well known Vegas themes and overused reel spins, it’s all neatly knit to form a complete story, backed up by truly astounding and original sound effects. Developed in HTML5 and Flash formats, Thunderkick's games are playable across a variety of platforms, and play well on almost any device you use for playing. The games are rendered in real time 3D accelerated graphics, as opposed to using pre-rendered video clips like many other slot developers. The effect of this is to reduce the size of the game download, and the difference in load speed is definitely noticeable. In many online reviews and discussions, you can find that players have been surprised by just how unique their games are. From visuals, to layout, to style and sounds, everything has a fresh and innovative approach to it. However the fact is Thunderkick offers fewer than 20 slots. We can see that this company prefers quality over quantity, but we hope that they will expand their offering of games in future. 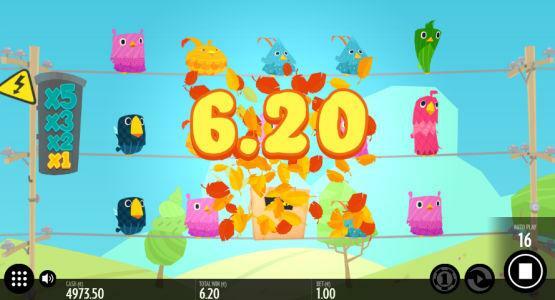 A few of their popular game titles include Sunny Scoops, Fruit Warp, Birds on a Wire and Magicious. Thunderkick slots are being rolled out by some top casino operators in the gambling industry. The very first online casinos that offered their games were Casumo Casino and Vera & John Casino. The complete list of Thunderkick casinos, with their reviews, can be found here on the CasinoGuru website. Thunderkick is a young company, new to the market, officially established in 2012. Their youthful nature can be seen in their young and innovative approach to their games. Alderney 6 Isle of Man 1 Malta 261 Gibraltar 51 Jersey 0 Kahnawake 0 Panama 0 Curaçao 137 Unknown 0 Belize 1 Costa Rica 0 United Kingdom 244 Austria 0 Canada 0 Antigua and Barbuda 0 Belgium 3 Bosnia and Herzegovina 0 British Virgin Islands 0 Bulgaria 0 Cambodia 0 Comoros 0 Cyprus 0 Czech Republic 0 Denmark 10 Estonia 3 Georgia 0 Ghana 0 Greece 0 Hungary 0 Ireland 0 Italy 2 Kenya 0 Latvia 0 Lithuania 0 Mexico 0 Netherlands Antiles 3 Nigeria 0 Paraguay 0 Peru 0 Philippines 3 Portugal 1 Romania 0 Serbia 0 Slovakia 0 Spain 2 Sweden 109 Aland Islands 0 Schleswig Holstein 1 British Columbia 0 Cagayan Economic Zone 1 Delaware 0 Nevada 0 New Jersey 0 Ontario 0 How we rate Licensing Jurisdictions?